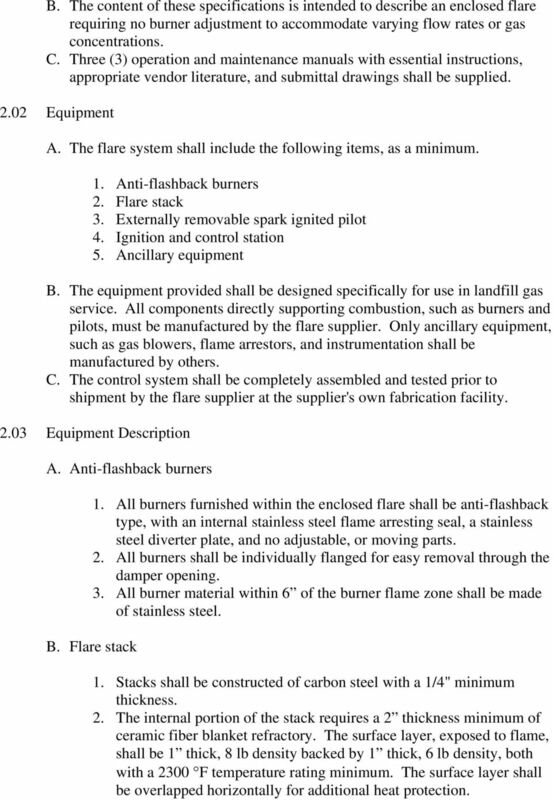 Download "LANDFILL GAS ENCLOSED FLARE SYSTEM"
2 E. The following utilities are required to support operation of the flare system. Pilot Gas (intermittent): Supplemental Fuel: concentrations Electricity: 22 SCFH of propane at 7-10 psig 50 SCFH of natural gas at psig may be required for methane below 30% 480 V, three phase, 60 Hz 1.03 Performance Requirements A. 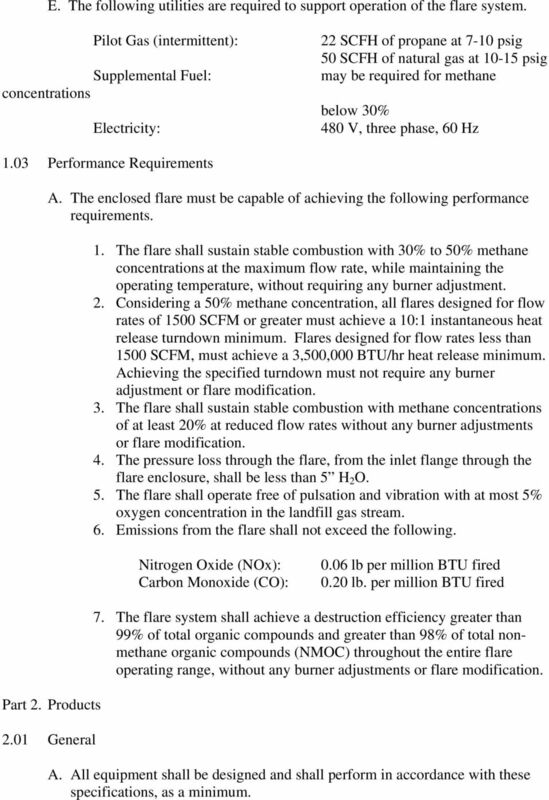 The enclosed flare must be capable of achieving the following performance requirements. 1. The flare shall sustain stable combustion with 30% to 50% methane concentrations at the maximum flow rate, while maintaining the operating temperature, without requiring any burner adjustment. 2. Considering a 50% methane concentration, all flares designed for flow rates of 1500 SCFM or greater must achieve a 10:1 instantaneous heat release turndown minimum. Flares designed for flow rates less than 1500 SCFM, must achieve a 3,500,000 BTU/hr heat release minimum. Achieving the specified turndown must not require any burner adjustment or flare modification. 3. The flare shall sustain stable combustion with methane concentrations of at least 20% at reduced flow rates without any burner adjustments or flare modification. 4. The pressure loss through the flare, from the inlet flange through the flare enclosure, shall be less than 5 H 2 O. 5. The flare shall operate free of pulsation and vibration with at most 5% oxygen concentration in the landfill gas stream. 6. Emissions from the flare shall not exceed the following. Nitrogen Oxide (NOx): Carbon Monoxide (CO): 0.06 lb per million BTU fired 0.20 lb. per million BTU fired Part 2. Products 2.01 General 7. The flare system shall achieve a destruction efficiency greater than 99% of total organic compounds and greater than 98% of total nonmethane organic compounds (NMOC) throughout the entire flare operating range, without any burner adjustments or flare modification. A. All equipment shall be designed and shall perform in accordance with these specifications, as a minimum. 3 B. 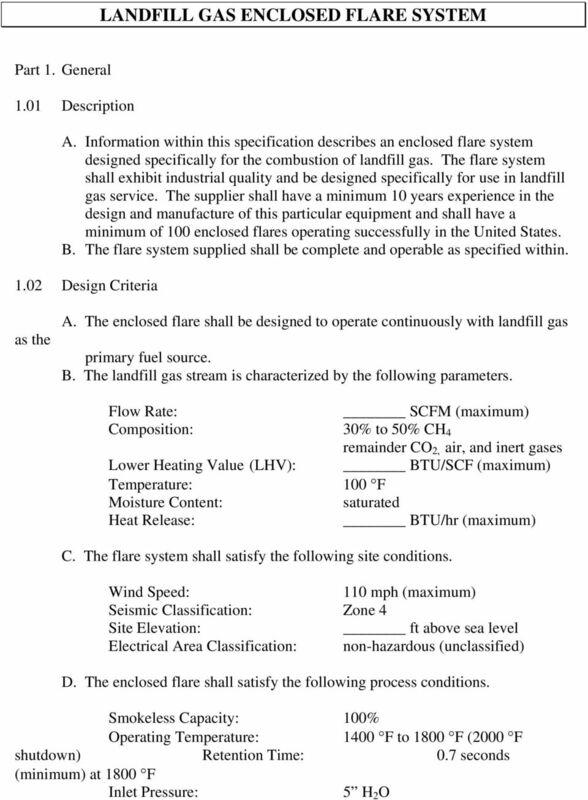 The content of these specifications is intended to describe an enclosed flare requiring no burner adjustment to accommodate varying flow rates or gas concentrations. C. Three (3) operation and maintenance manuals with essential instructions, appropriate vendor literature, and submittal drawings shall be supplied Equipment A. The flare system shall include the following items, as a minimum. 1. Anti-flashback burners 2. Flare stack 3. Externally removable spark ignited pilot 4. Ignition and control station 5. Ancillary equipment B. The equipment provided shall be designed specifically for use in landfill gas service. All components directly supporting combustion, such as burners and pilots, must be manufactured by the flare supplier. Only ancillary equipment, such as gas blowers, flame arrestors, and instrumentation shall be manufactured by others. C. The control system shall be completely assembled and tested prior to shipment by the flare supplier at the supplier's own fabrication facility Equipment Description A. Anti-flashback burners 1. All burners furnished within the enclosed flare shall be anti-flashback type, with an internal stainless steel flame arresting seal, a stainless steel diverter plate, and no adjustable, or moving parts. 2. All burners shall be individually flanged for easy removal through the damper opening. 3. All burner material within 6 of the burner flame zone shall be made of stainless steel. B. Flare stack 1. Stacks shall be constructed of carbon steel with a 1/4" minimum thickness. 2. 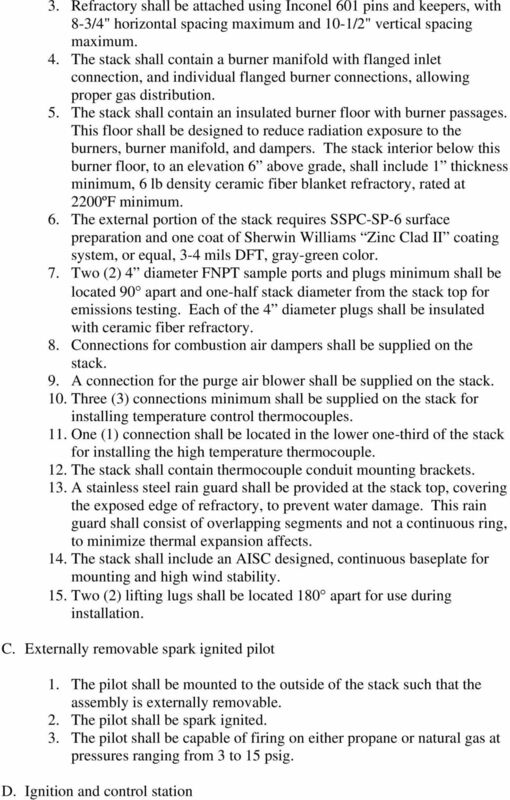 The internal portion of the stack requires a 2 thickness minimum of ceramic fiber blanket refractory. The surface layer, exposed to flame, shall be 1 thick, 8 lb density backed by 1 thick, 6 lb density, both with a 2300 F temperature rating minimum. The surface layer shall be overlapped horizontally for additional heat protection. 5 Provide a complete and functional control system designed for 480 V, three phase, 60 Hz incoming power, including transformer conversion as required for operating the flare system. The following items shall be completely mounted, assembled, and wired on a structural steel rack. 1. One (1) weatherproof single phase power transformer to convert electrical service from 480 V to 120 V. 2. 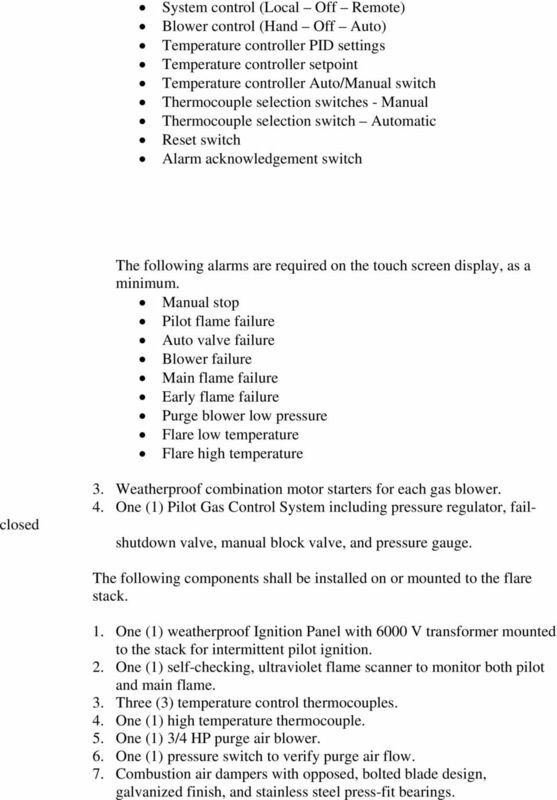 One (1) weatherproof Flare Control Panel including the following instrumentation for safe, overall system operation and control. Allen Bradley programmable logic controller, or equal High temperature shutdown switch Self-checking flame scanner amplifier and relay Honeywell DR 4500 Truline digital circular chart recorder, or equal Purge air blower motor starter Automation Direct 6 touch screen display or equal. The following switch and lights are required are required on the front of the control panel, as a minimum. 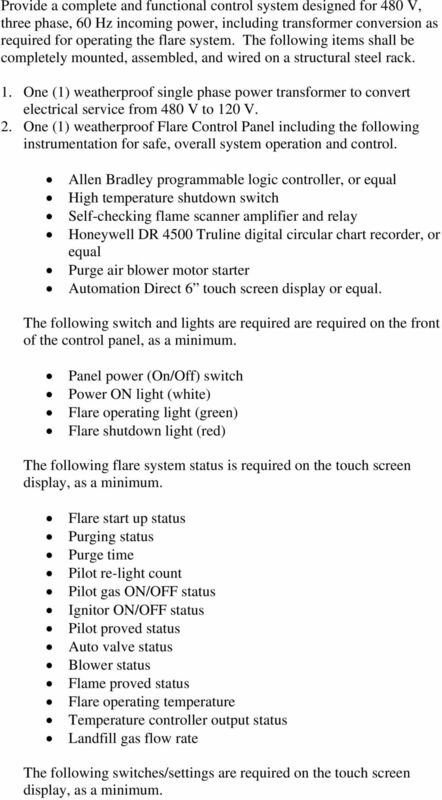 Panel power (On/Off) switch Power ON light (white) Flare operating light (green) Flare shutdown light (red) The following flare system status is required on the touch screen display, as a minimum. Flare start up status Purging status Purge time Pilot re-light count Pilot gas ON/OFF status Ignitor ON/OFF status Pilot proved status Auto valve status Blower status Flame proved status Flare operating temperature Temperature controller output status Landfill gas flow rate The following switches/settings are required on the touch screen display, as a minimum. 6 System control (Local Off Remote) Blower control (Hand Off Auto) Temperature controller PID settings Temperature controller setpoint Temperature controller Auto/Manual switch Thermocouple selection switches - Manual Thermocouple selection switch Automatic Reset switch Alarm acknowledgement switch The following alarms are required on the touch screen display, as a minimum. Manual stop Pilot flame failure Auto valve failure Blower failure Main flame failure Early flame failure Purge blower low pressure Flare low temperature Flare high temperature 3. Weatherproof combination motor starters for each gas blower. 4. One (1) Pilot Gas Control System including pressure regulator, failclosed shutdown valve, manual block valve, and pressure gauge. The following components shall be installed on or mounted to the flare stack. 1. One (1) weatherproof Ignition Panel with 6000 V transformer mounted to the stack for intermittent pilot ignition. 2. One (1) self-checking, ultraviolet flame scanner to monitor both pilot and main flame. 3. Three (3) temperature control thermocouples. 4. One (1) high temperature thermocouple. 5. One (1) 3/4 HP purge air blower. 6. One (1) pressure switch to verify purge air flow. 7. Combustion air dampers with opposed, bolted blade design, galvanized finish, and stainless steel press-fit bearings. 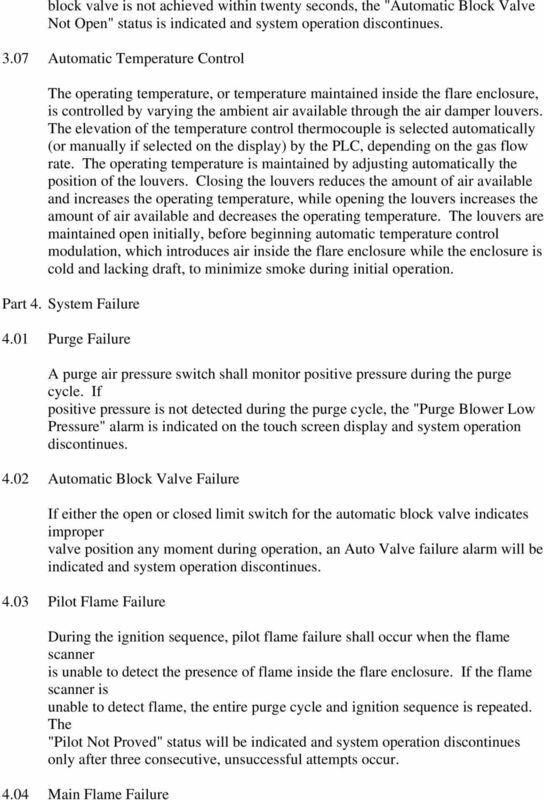 10 Main Flame Failure occurs, once the ignition sequence is complete, when the flame scanner is unable to detect flame is present inside the flare enclosure. 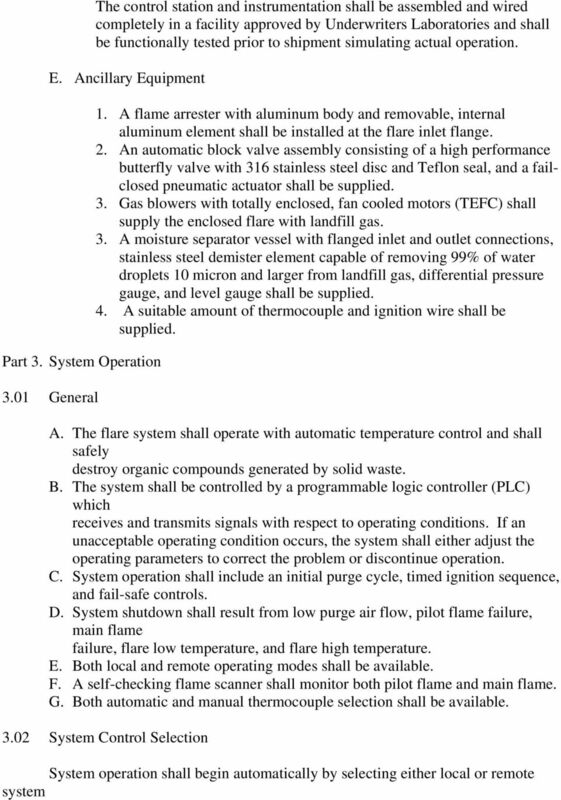 When Main Flame Failure occurs, system operation is interrupted momentarily. 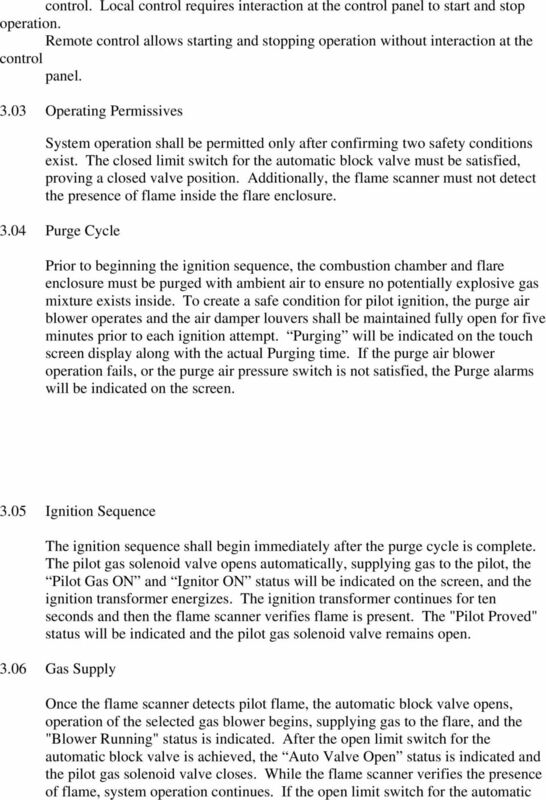 Then the entire purge cycle and ignition sequence are repeated automatically. A Shutdown occurs only after three consecutive Failures, or unsuccessful attempts. Once Main Flame Shutdown occurs, the "No Main Flame" status is indicated and system operation discontinues Flare Low Temperature Flare low temperature shall occur when a temperature below 1400 F is detected inside the flare enclosure by the selected controlling thermocouple and exists for ten minutes consecutively. The corresponding "Flare Low Temperature" alarm is indicated and system operation discontinues. The low temperature timer resets the moment a temperature above 1400 F is detected during normal operation Flare High Temperature inside High Flare high temperature shall occur the moment a 2000 F temperature is detected the flare enclosure by a dedicated high temperature thermocouple. 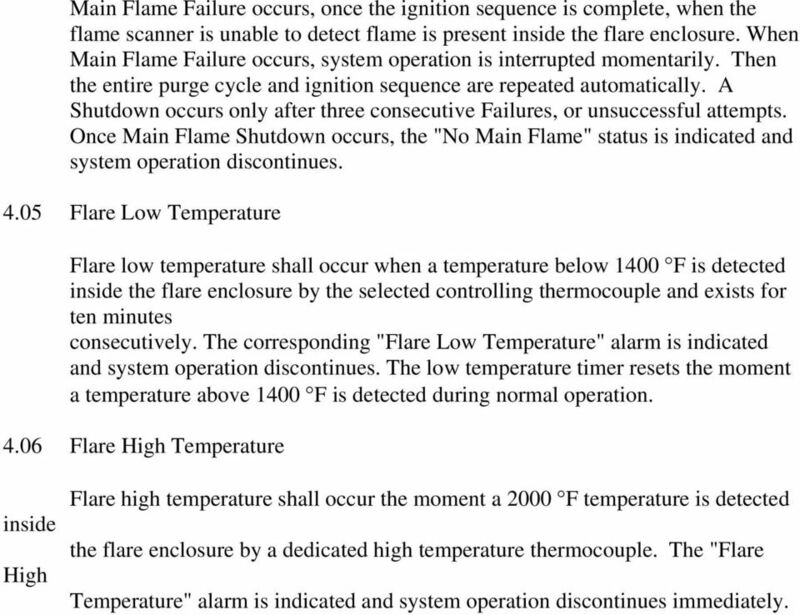 The "Flare Temperature" alarm is indicated and system operation discontinues immediately. C. Burner management system to follow requirements of Industrial Risk Insurers (IRI). Boiler Preparation, Start-Up and Shutdown Learning Outcome When you complete this module you will be able to: Describe the basic preparation of a boiler for start-up, and the start-up and shutdown procedures. SPECIFYING A COST EFFECTIVE LANDFILL FLARE SYSTEM Presented at SWANA s 28th Annual Landfill Gas Symposium San Diego, California March 8, 2005 SPECIFYING A COST EFFECTIVE LANDFILL FLARE SYSTEM Brandy S.
Combustion Pulsation and Noise by Dan Banks, P.E., Banks Engineering Inc.
HOW MUCH FUEL DOES A GAS STOVE CONSUME AND HOW MUCH DOES IT COST TO OPERATE? SOLID FUEL TO NATURAL GAS CONVERSIONS FOR EXISTING BOILER APPLICATIONS William Gurski Director Power Sales Zeeco Inc.
Chapter. Flares and Stacks. Flares (FLR)... 16-3. Stacks (STK)... 16-9. G2 ICARUS Corporation, 1998. Combustion Basics. There is more to a burner than just blowing fire into a boiler or other heating device. Just what is a burner supposed to do? with MERCURY FREE 1 HP Relays ! WARNING Before using this product read and understand instructions. Pump Specifications 250 Series Submersible Sump / Effluent Pump 2 Solids handling 250_P1 R10/7/2015 Copyright 2015 Liberty Pumps Inc. All rights reserved. Specifications subject to change without notice. TDD-D-1. Downflow/Horizontal Condensing, Gas-Fired Furnace FREEDOM 90 ADC1D120A9601A. Single-Stage Fan Assisted Combustion System PUB. NO. SECTION 23 34 00 - HVAC FANS PART 1 - GENERAL 1.1 SUMMARY A. Section Includes: 1. Centrifugal fans. 2. Propeller fans. 3. Downblast centrifugal roof fans. 4. Upblast centrifugal roof fans. 5. Ceiling fans.